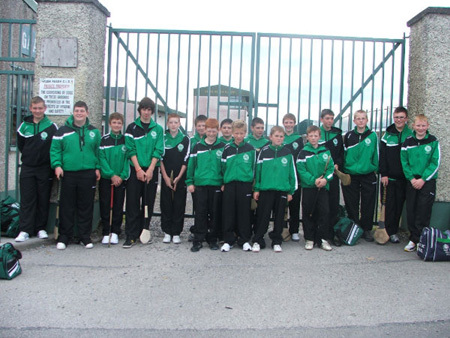 Last Thursday morning our under 14s headed off to Dublin to take part in F�ile na nGael it was a very excited group that met at Father Tierney Park at 7am that morning. After a lovely breakfast in Monaghan the lads were ready for the challenges that lay ahead in Rush. We landed in Rush on a lovely day. The St Maur's club had a great reception laid on for us. Our first game was against the host club St Maur's. Despite the long trip and the early start the lads really tore into the Dublin lads. They showed no ill effects of their early start, the lads settled into the game and soon got into their stride playing some lovely hurling. In a very close game with both teams going hell for leather the large Ballyshannon support got the boys over the line in a great game winning out 2-7 to 2-3. Straight after the game the host club laid on a great feed for both teams and supporters and after meeting the host families the stage was now set for the trip to Croke Park for the parade. 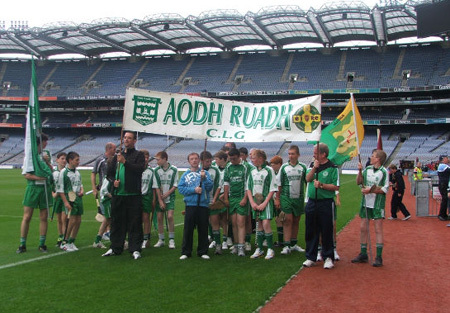 It was a proud bunch of lads who took their seats in the Hogan Stand ready for the parade. 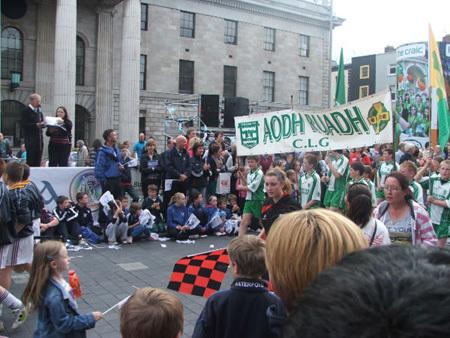 We made our way down to O'Connell Street where the great M�che�l � Muircheartaigh gave the Aodh Ruadh boys a great introduction to the huge crowds, again it was wonderful for the lads to see so many parents cheering them along the route. 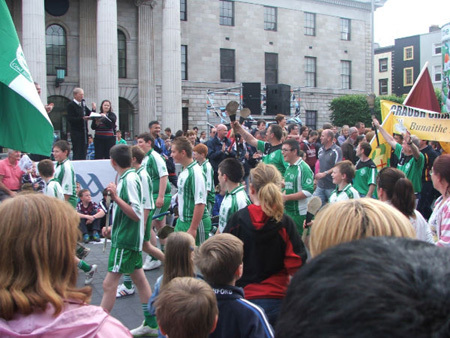 From O'Connell Street it was back to Rush and the lads went to the host families for a well deserved night's sleep. 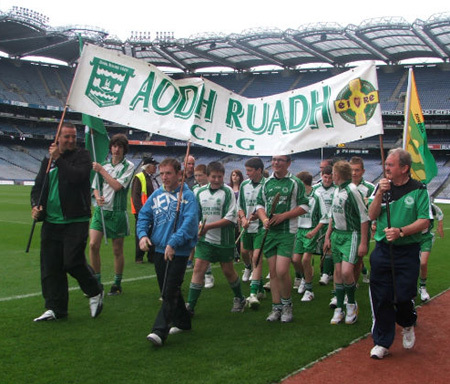 Bright and early on Friday morning we all met up at Rush all four teams in our division paraded onto the field in Rush led by a band, our lads proudly stood for Amhr�n na bhFiann ready for the next game knowing that they were well up for the challenges that lay ahead. We played another Dublin team Good Counsel who were playing for their F�ile survival. In one of the best performances of the season the lads played some brilliant passionate hurling, they led throughout the game and all 17 players gave a great display full of commitment passion and skill and ran out convincing winners on a score line of 2-7 to 0-3 in atrocious conditions. So with two games under our belt and two wins recorded the boys were delighted to have the lovely lunch laid on by St Maur's and to get some rest from the terrible weather. St Maur's had some great entertainment laid on to lift the spirits on what was now a terrible day weather wise, an inflatable five-a-side soccer pitch. 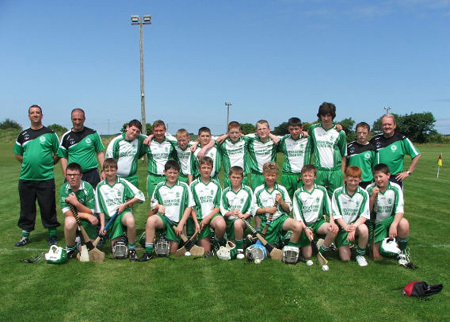 There were some great games as vigorously contested as any of the hurling matches. That night there was more great food laid on by St Maur's with all the children and parents being looked after brilliantly by their hosts, St Maur's main Feile organiser Peter Monks thanked the Aodh Ruadh club for making it such a great weekend and thanked all the teams for the great hurling that was played. On behalf of Aodh Ruadh juvenile Hurling Committee John Rooney thanked St Maur's for their hospitality over the weekend and invited them to Ballyshannon for the Alan Ryan/Seamus Grimes under 16 tournament next May and made a presentation to them on behalf of Aodh Ruadh. All the parents had a great night and let their hair down on the dance floor in Tamango's rolling back the years with all the disco classics. 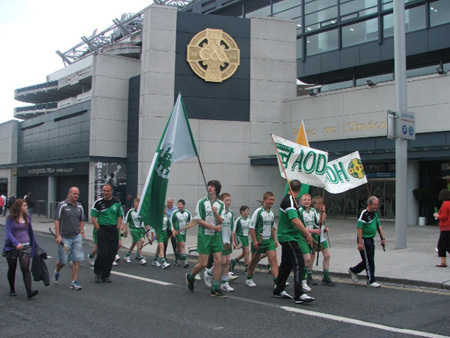 On Saturday morning we all met up again at the club house and all the lads said goodbye to their host families where once again the Rush people were at pains to point out that not alone were the Aodh Ruadh lads well able to hurl they were very well behaved and were a credit to their club and families. So a great weekend came to an end and we all learned a lot and our squad will be the stronger for it. 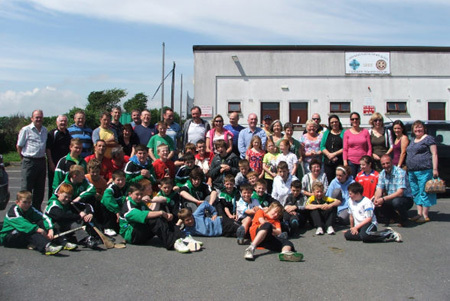 On behalf of the panel we want to thank all the parents who made a great effort to make it to the F�ile taking time off work to support the lads, their support proved very valuable and was much appreciated by the panel and management. We will have pictures from Tara Keenaghan up on aodhruadh.org later this evening.